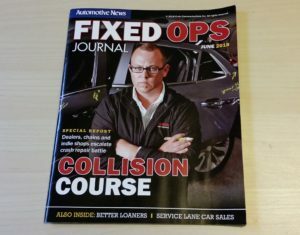 The June 2018 Fixed Ops Journal contains a special report on collision repair, and dealership and independent shops should take advantage of the coverage in the free quarterly magazine from the Automotive News publisher. Besides getting a sense of the industry from the perspective of a dealership — one of Automotive News’ target audiences and a potential competitor in some markets — shop owners can also tap the more general content contained in the same issue. Some of the advice for running a mechanical service and repair operation might translate to the sister collision repair industry. Here’s some of our picks from the dozen or so pages in the Fixed Ops Journal dedicated to the auto body repair sector. “Body building: Collision repair presents opportunities, obstacles to dealerships”: Editor David Kushma lays out the industry for a dealer. “Crash program: Advanced vehicle technology could give edge to dealership body shops in collision repair contest”: More good stats and quotes in this report, which is probably the article to read if you had to pick just one. Among its noteworthy elements are discussion of how manufacturers and dealerships are poised to recapture customers. “As the cars get more sophisticated, the owner has a greater desire to bring it back to the place it came from,” Allstate claims director in innovation and customer experience Clint Marlow told Fixed Ops Journal. The Fixed Ops Journal piece also offers estimates of how much establishing a well-equipped body shop might cost: $1.2 million-$2 million. “Nick Notte, senior vice president at (I-CAR), estimates that a 15,000-square-foot collision center, stocked with the tools and scanners needed to repair vehicles with such features as advanced electronics and aluminum panels, would cost at least $1.2 million,” Fixed Ops Journal reported. “Estimable life: Dealership repair writers balance demands of customers, insurers and collision technicians”: There’s a lot of discussion of Allstate’s direct repair program and interactions in general with insurers at a Southgate, Mich., dealership shop. The magazine also reported interesting aspects of “estimable life,” including that dealer estimators in the Detroit area make $40,000-$60,000 and the estimator profiled by the magazine usually works from 7:30 a.m. to 6 p.m. Bonus suggestion: While not part of the magazine’s collision repair package, Fixed Ops Journal’s Q&A with Dealerware Executive Vice President Russell Lemmer offered a really interesting perspective on the economics and customer experience of loaners. You might like it even if you’re not among the car rental community or the shops which still maintain loaners. Featured image: The June 2018 Fixed Ops Journal contains a special report on collision repair, and dealership and independent shops should take advantage of the coverage in the free quarterly magazine from the Automotive News publisher.